A singularly weird and drug-fueled private eye, not for the faint-hearted. 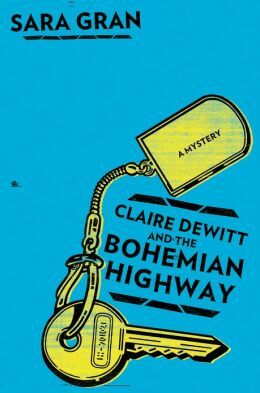 Sara Gran’s Claire DeWitt and the Bohemian Highway gives us a refreshingly bizarre twist on the classic private investigator. Readers of Claire DeWitt and the City of the Dead will recognize Claire’s copious and indiscriminate drug use (she never fails to check a medicine cabinet and pocket the contents; she seeks dealers like she seeks clues) and her generally hard-bitten lifestyle. Similarly unconventional is her somewhat metaphysical style of detection, guided in part by a controversial dead French detective who speaks to Claire through his book. When Claire’s ex-boyfriend Paul is murdered, and several of his valuable guitars go missing, his wife, Lydia, hires Claire to look into things. A simultaneous case involves a diminishing herd of miniature horses up in Marin County: Claire suspects they may be committing suicide. The action shifts from contemporary San Francisco, where Claire hunts Paul’s guitars and his killer, to the Brooklyn of Claire’s adolescence, where she and two friends once investigated a missing girl. One of those friends will later go missing herself; and the whispers of the missing Tracy, the dead Paul and the possibly suicidal miniature horses haunt Claire as she tries to keep it together and solve a murder through the haze of various uppers and downers. Strange, distinctive characters are one of Gran’s greatest strengths, coupled with a strong sense of place and a gritty atmosphere of depravity and mysticism. Dark, classic PI adventures with an unprecedented zaniness mixed in make Claire DeWitt a rare reading experience. This review originally ran in the June 25, 2013 issue of Shelf Awareness for Readers. To subscribe, click here, and you’ll receive two issues per week of book reviews and other bookish fun! To be honest I don’t really read much detective/mysteries but this one has caught my attention. I’ve added “City of the Dead” to my list and if it ends up being to my liking, I will check out this one. I had to look up both of those names!! I should have footnoted. Even a lot of mystery fans would have needed explanation, since the books were written by a “literary” writer and a “sci-fi/humor” writer. No worries, I have the google. Thanks for the link! Apparently I omitted the narrator’s name from my earlier review of her first book (horrors!) but it was the same woman, naturally; and I wholeheartedly agree that she gets it spot-on. This was a good description of Claire Dewitt’s charms and uniqueness, too. Well done.